Come for the scenic view, not the waterfall. Bear Rock Falls could be a destination in its own right, but someone would have to construct a series of ladders or even a via ferrata route to allow visitors to descend from the top of the falls down to quality perspectives of the waterfall. The terrain is so steep here on both sides of the stream that scrambling down is completely out of the question. If one were to see the entire falls, they would likely find about 300 feet worth of horsetails and plunges. As it stands now, the view of the falls is limited to the top, where you can see perhaps 40 feet worth of drop. Luckily for all of us, that vantage point also includes an extremely picturesque view of the valley to the east from an open ledge. I highly recommended that you also add in a hike to either the summit of Bear Mountain or Mt. Race as part of a trip to Bear Rock Falls. 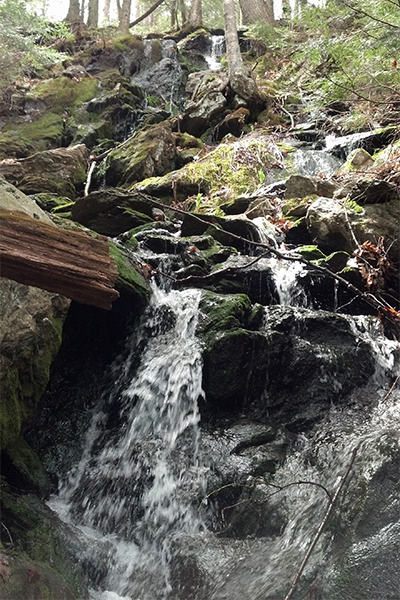 If you have two cars, you could even traverse from East Rd all the way to the Race Brook Trailhead on MA 41, visiting outstanding Race Brook Falls en route. Bear Rock Falls is interesting, but by adding any one of these bonus options to your hike will make your day hike far more rewarding. From the small parking area, head east on a wide and obvious old fire road (called Northwest Rd) toward the Appalachian Mountain Club's Northwest Cabin. Just before you reach the cabin (which will be on your right) in 0.3 mile, take a left and continue on the unmarked but obvious trail for an additional 0.7 mile to its junction with the Appalachian Trail. Turn left and head north along the white-blazed Appalachian Trail. The trail will soon enter Sages Ravine and you will hike downstream and parallel with the stream. After 1.6 miles, you must cross Sages Ravine Brook. From this crossing, continue north for an additional 1.4 miles and you will reach Bear Rock Stream. Bear Rock Stream is a very short distance north of the spur that leads left to the Laurel Ridge backcountry campsites. Once you reach the stream, you will have to bushwhack a short distance downstream with the river on your right. You will reach a great view and the top of the falls in only about 200 feet. It is far too dangerous to try to obtain any other view of the falls other than from the top. I am not one to head to such warnings too easily myself, but there is absolutely no way I would scramble down the nearly vertical cliff walls surrounding the falls here. From the junction of MA 23, MA 41 and US-7 in Great Barrington, take the combined highway MA 23 west and MA 41 south into Egremont. After crossing into Egremont, take a left onto MA 41 south. After 0.1 mile on MA 41, take a right onto Mount Washington Rd, which is marked with a sign for Mt. Washington/Mt. Everett. Follow Mount Washington Rd, which is also called East St, for 11.7 miles and there will be a small parking area on the left that can fit about six cars. This parking area is 2.8 miles south of the Mt. Washington State Forest headquarters. There is a small sign at the parking area for AMC Northwest Cabin Parking. The last few miles is on a dirt road, but it is generally well-maintained.